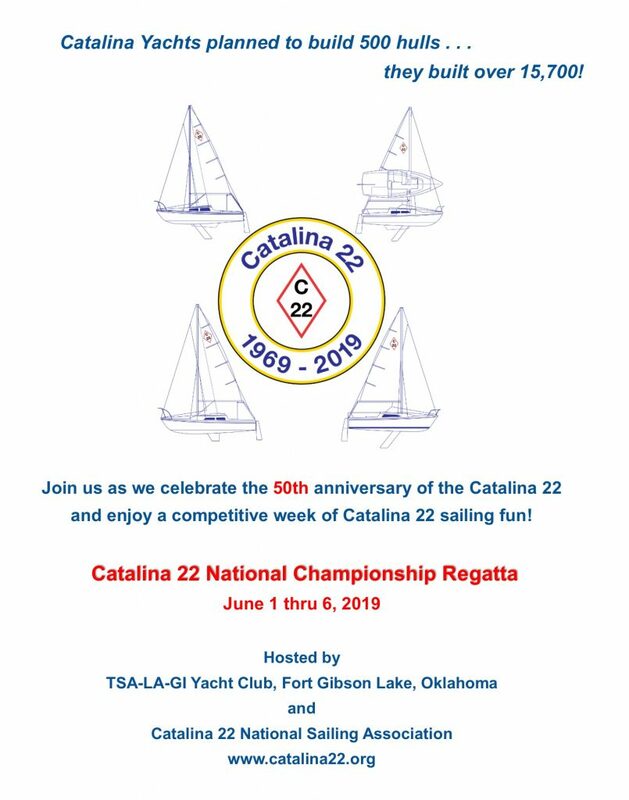 The Catalina 22 National Sailing Association and the TSA-LA-GI Yacht Club of Fort Gibson Lake, Oklahoma are pleased to announce the 2019 Catalina 22 National Championship Regatta the week of June 1-6 at Jackson Bay at Fort Gibson Lake, Oklahoma. Fort Gibson Lake is located east/southeast of Tulsa, Oklahoma. The Notice of Race is available at www.catalina22.org. Membership in the Catalina 22 National Sailing Association is required. Facebook event can be found here. This is a milestone event for Catalina 22 sailing community as we will also celebrate 50 years of Catalina 22 production and the participation of HULL #1 in the race! C22NSA Vice Commodore Duncan McBride and his team at the Tsa-La-Gi Yacht Club are planning a top-notch racing event for all Catalina 22 sailors and enthusiasts to enjoy. Whether you own an original Catalina 22, Catalina 22 New Design, Catalina 22 Mk-II or Catalina 22 Sport, we invite members of the Catalina 22 National Sailing Association to mark your calendars and prepare your boats for a great sailing event, both on-the-water and on-shore.